Jacob Janowski's luck had run out―orphaned and penniless, he had no direction until he landed on a rickety train that was home to the Benzini Brothers Most Spectacular Show on Earth. A veterinary student just shy of a degree, he was put in charge of caring for the circus menagerie. It was the Great Depression and for Jacob the circus was both his salvation and a living hell. There he met Marlena, the beautiful equestrian star married to August, the charismatic but brutal animal trainer. And he met Rosie, an untrainable elephant who was the great hope for this third-rate traveling show. The bond that grew among this group of misfits was one of love and trust, and ultimately, it was their only hope for survival. Jacob was there because his luck had run out--orphaned and penniless, he had no direction until he landed on this locomotive "ship of fools." It was the early part of the Great Depression, and everyone in this third-rate circus was lucky to have any job at all. Marlena, the star of the equestrian act, was there because she fell in love with the wrong man, a handsome circus boss with a wide mean streak. And Rosie the elephant was there because she was the great gray hope, the new act that was going to be the salvation of the circus; the only problem was, Rosie didn't have an act--in fact, she couldn't even follow instructions. The bond that grew among this unlikely trio was one of love and trust, and ultimately, it was their only hope for survival. 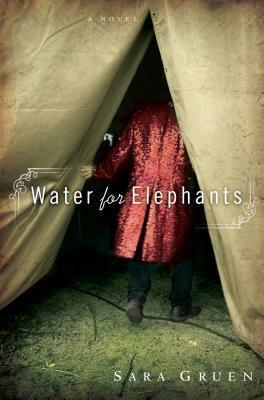 Surprising, poignant, and funny, "Water for Elephants" is that rare novel with a story so engrossing, one is reluctant to put it down; with characters so engaging, they continue to live long after the last page has been turned; with a world built of wonder, a world so real, one starts to breathe its air. "[This] sprightly tale has a ringmaster's crowd-pleasing pace." Die gebürtige Kanadierin Sara Gruen zog es zunächst aus beruflichen Gründen in die USA. Als sie dort den Job verlor, begann sie zu schreiben. Sara Gruen lebt zusammen mit ihrem Mann, drei Kindern, zwei Pferden, zwei Hunden, vier Katzen und einer Ziege in der Nähe von Chicago.